After sharing some of my recent favorite links yesterday, I thought I’d show you what I’ve been writing at work lately. I’ve been getting around, and I haven’t really promoted any of it on the blog. “Everyone loves stories. Children beg their parents for just one more before bedtime. Campers lose themselves in spooky campfire yarns. Bars fill up with heavy-drinking fish-tale-tellers. What Is Voice in Writing, and How Can You Find Yours? “Voice is a style; think of it as the personality in your writing. Just as each being’s personality is unique, each writer’s voice is, too. I’ve been around the block at a few other places, but I figure I’ll go easy on you and give you a little at a time! This entry was posted in Reading & Writing, Uncategorized. I really enjoy the copyblogger website. Even before I started working in the social-media world, I read the site daily, as it offers a lot of practical writing advice. I’ve been working on a project for Buzzfarmers about storytelling marketing, so yesterday’s post really stood out to me. I love how they include infographics, and today’s seemed perfect for sharing! I hope you’ll check out the first installment of my handbook on BuzzFarmers’s blog. Today’s post, “Storytelling Marketing: Creative Writing in Blogging and Business,” is the first of many! Like this infographic? Get content marketing training from Copyblogger Media that will give you an unfair business advantage. This entry was posted in Reading & Writing. What are you doing March 22-28, 2015? If you love writing, and you have no plans for that time period, I can tell you exactly what you will be doing. You’ll be attending Praiano Writers, a cross-genre writing experience lead by the great Lary Bloom, Suzanne Levine, and Roya Hakakian. If you’re still reading this, I’m confused. I honestly expected you to click right over and leave this page to learn more about the wonders of studying under some of the greatest mentors of all time. How else can I convince you that this is an opportunity you don’t want to miss? Well, as a former student of Lary Bloom, I can attest that he is a phenomenal instructor. He is patient, yet pushes you. He is kind, yet direct. He is motivating, persistent, and cares so much about you as a person, writer, and student. I can say with all honesty that Lary Bloom changed my life. Having him as a mentor was exactly what I needed when I needed it, without even knowing I needed something. He had an insight to my writing that I wasn’t even aware of at the time. In fact, I think that may be the biggest lesson he taught me: how to be aware of the undercurrents in my own writing. I was once writing about what it was like to have autoimmune issues. The overall theme of the essay was: are you allowed to be sick if other’s didn’t give you permission to be sick? Often if others can’t see physical symptoms of an illness, it is dismissed by the people around you. Lary was shocked to find out my parents hadn’t found their way into my essay. “Why would my parents be in an essay about my autoimmune issues?” I asked him. “Erin,” he practically shouted (but didn’t, as Lary is not prone to yell at his students), “Your father is a psychologist and your mother is a nurse. There has to be something there when you relate it to an illness others cannot see!” While the story never became about my parents, including information about the people close to me and other influences in my life took the essay to a much deeper, different place it started. All I can say is that I am sincerely grateful for the time I studied under Lary Bloom. Now, I haven’t studied under Suzanne or Roya, though I have heard wonderful things about them both. That and I know Lary, a great judge of character, makes company with people he admires. I hope you’ll take my suggestion seriously and consider attending Praiano Writers in March 2015. I love brunch. Everything about the combination of breakfast and lunch just feels so right to me. But besides the meal, there is another brunch I love – the It’s Just Brunch Blog. The awesome creators of this writing website are three of my graduate school peers I really admire. All three were recently tagged by Sonya Huber, a nonfiction extraordinaire, to complete the Writing Process blog tour. Zac then tagged me to be the next stop, and if Zac tells you to do something, you just do it. I’m working on writing essays. Not a collection of essays, but just one essay at a time (though I’m working on many of them). For so long after I graduated, I stressed about publishing a collection or a memoir. I knew my thesis wasn’t ready to send to an agent or editor, but I was honestly just tired of working on it, so I stopped. Do you know what happened at that point? I didn’t write anything – at all. It’s very easy to be a writer who doesn’t write. Have you ever tried it? You do a lot of thinking about writing. You do a lot of looking at blank pages. You do a lot of thinking about things you could write (if you were to write which you obviously aren’t doing). It’s even easier to not write when you’re the editor of a literary journal. You’re involved in writing. You’re curating a journal! You’re editing the work of other writers! This must mean it’s okay to not be writing, right? Wrong. It means you dry up (and by “you” of course I mean me). You won’t know where or how or when to start again. You’ll feel hopeless – like a failure. Until you try again, and you must always try again. It’s hard to wake the muse up, but once she has risen you’ll develop a rhythm again. This is all to say: I’m going easy on myself. Instead of all the pressure, I’m just focusing on enjoying the process of writing, and man, I like it this way so much more. I’m not sure it completely differs from the rest of the genre, but something I do well is writing an honest, self-deprecating narrator. I’m not sure. I write stories that I feel are important to me. I think it is important to understand your perspective when writing. When I started graduate school, my perspective was much different than it is now. I was single then. I worked two jobs seven days a week, easily working almost 70 hours a week, spending little time with my friends and family. I was trying to absorb as much as I could of my schoolwork. Now, I’m a stepmom, a wife, an editor. My views have changed over time. Can I write now about how I felt when I was 24? Of course I can. But I think there is something important about writing in the present. Writing about what is real to you in the moment has some power. I’m trying to harness what is real to me now – in the moment – and see if it is publishable. If it isn’t, I keep it in a folder for a while, and maybe it will be worthy in the future…maybe not. Man, I have written some bad stuff, but I just can’t stop. This usually means I overwrite. I write so much junk, and I’m stuck cutting a lot of what I’ve written. I hate that. Tossing words seems so wrong. much of what I’ve written isn’t working, which I understand. A lot of writing essays is just playing with the words. Once you find the combination that works is when the story is complete. 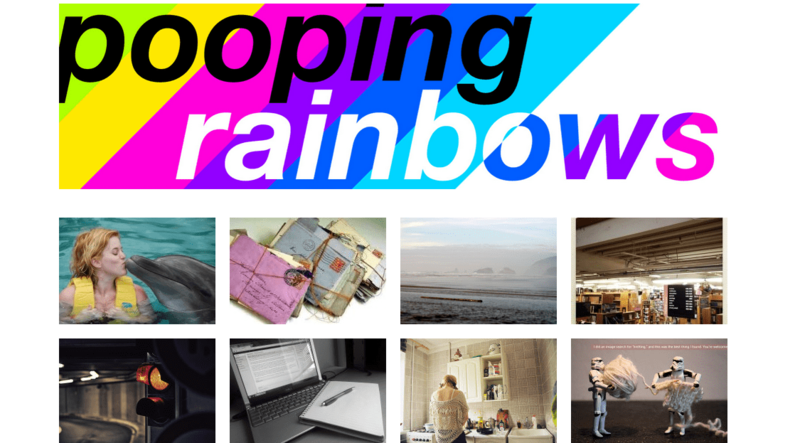 I’ve been reading Pooping Rainbows since the day the group formed. I thought that a monthly blogging project would be an incredible addition to my reader. Thirty (and more) different voices to read each month with one distinctive voice for each day. You can always count on Peter for a great idea. After a while of reading, I queried Peter and let him know I’d love to write if he’d have me (and he had space for me), and low and behold, it appears that I’ve got great timing. Today is my first day posting on the site. You can check out my get-to-know-me post here. I’ll be back on Pooping Rainbows every 22nd of the month. This entry was posted in Pooping Rainbows, Reading & Writing. The government shut down. What the heck? Are we for real here? So sad. If you are wondering what has been affected by the shutdown, click here. Spry, my literary journal, held its first reading in Boston, MA. It was a fantastic evening. Briefs, the Spry blog, will have a post up soon about the event. We met a fun and awesome accordion player from Berlin who happened to stop by the event. Here is his post about meeting us, but the Spry blog will also have a post about him this week. The Red Sox are in the playoffs, and I will be attending a ALDS game! Mr. O and I both celebrated our birthdays last month. I’m going to PaintNite this week with some of my girlfriends. I can’t wait to show you my artwork! My plan is to put aside time to try to get some of these stories on the blog. Update: I needed to include the following video on this post. Honestly friends, this is what our country truly believes. I feel very fortunate to live and work with benefits, such as health insurance, in the state of Massachusetts. Much of what is in the Affordable Healthcare Act is already in place in Massachusetts. There are no preexisting clauses, all companies with a certain number of employees must offer health coverage, etc. I’m not going to argue politics here, but I’d love for everyone to put politics aside and do some research. When was it that people stopped researching things and started adopting what they hear from others or making assumptions. I know you’ve probably seen this video a bunch of times today, but I honestly can’t help but reposting. 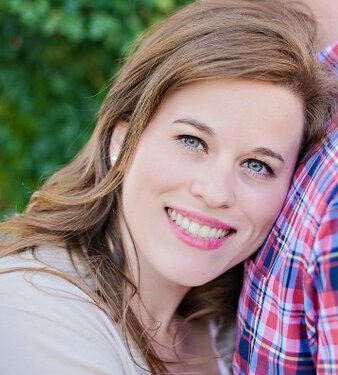 Before I say goodbye (for the second time), I’d like to redirect you to my friend Becky’s blog from today. She talks about the government shutdown and shares her thoughts so eloquently. I fully stand behind her post. This entry was posted in Reading & Writing, Spry Literary Journal, Travel, Weddings & Special Events. Somebody needs to get me this shirt. Big News: I’m going to sit on a panel for AWP 2014 in Seattle, Washington! This link was borrowed from AWP’s list of accepted panels. This entry was posted in Goals, Graduate School, Reading & Writing. Alright, folks. It’s time to get some goals. This month I’d like to increase my blogging. Whether I’m writing a post for this site or for Briefs, Spry’s new blog feature, it doesn’t matter. In the same regard, I’d like to increase my writing overall. In July, I managed to do some freewriting a few times a week, and I’d like to continue that into August. That’s it guys. Nice and easy. Hopefully you’ll be seeing a lot more of me around these parts. This entry was posted in Goals, Reading & Writing. I was so excited when I woke up this morning to find that Spry Literary Journal was featured on Every Writer’s Resource! It was also featured on Racquel Henry‘s Opportunities in the Great Big Literary World weekly post today. This entry was posted in Reading & Writing, Spry Literary Journal. First off, I’d like to wish my friend Jessica and her new husband Christian a happy wedding day today. I just returned from their beautiful wedding ceremony and I wish them the best. Okay, so yet again I failed my goal for the month of August. My plan was to write daily. My goal was to try to do a lot of journal writing, and not worry so much about essays, etc. Barely anything got written this month, folks. I did write in my journal a bit more regularly, but it was nothing to be proud of. My goal for September is to focus on Spry Literary Journal. Since we are a new literary journal, we need to work on marketing, as well as putting out a call for submissions for our first issue (due December 2012). So far, I have been quite pleased with the submissions we’ve received. I think this first issue will be a great showcase of our future as a literary journal. Spry can only continue to grow at this point, so I’m sure you will be hearing A LOT more about it on the blog in the near future. Mr. O, Wolverine and I went to DC and VA on a road trip for our summer vacation. This was a fantastic trip, because not only did we get to do fun things with Wolverine (the National Zoo, Smithsonian’s Museums of Natural History and American History), but we also spent a few quality days with one of my closest friends who lives in VA. She just had a beautiful baby girl last month, so it was so nice to be with mommy, daddy and baby (and puppies!). Wolverine started playing football this month. He is such a little stud. He’s the youngest guy on the team, and he has a lot to learn, but he’s trying hard. It is so damn cute to see him at the water breaks, because he takes his helmet off and his face is all red and his hair is sweaty. He’s going to break so many hearts when he gets older. Spry Literary Journal began accepting submissions! I can’t even describe how I felt when we got our first submission (and it was a GREAT submission too). It was incredible to read someone’s work after all the effort we put in to this journal. If you are a writer, please consider submitting your work to my literary journal. We went to Mr. O’s work “picnic” in the middle of the month. When I say picnic, I really mean carnival. It is always so much fun. I held an alligator while I was there! I’m doing a great job keeping up with my 365 photo project. As of today, I am on day 210. TWO HUNDRED AND TEN!?! I’m no longer a graduate student. Weird, I know, because all I did was complain about school while I was in it. I just miss it. I’ve felt pretty busy and disorganized this month. I expected things to slow down a bit after graduation, but that didn’t happen one bit. In fact, I feel as if I was working even harder to catch up, and stay on track (or close to the tracks at least). I only spent a few days with my friends from VA! I know I mentioned this as a highlight, and it truly was. It is just hard to leave such incredible friends. Especially when they have a new addition to their life. I love babies. So now, I’m saying goodbye to three people (and two dogs), not just two people. Sigh. It’s hard to live far away from your friends. Dr’s appointments. Between my primary care, my dermatologist and my dentist, I feel like all I’ve done is go to appointments this month..
My parents and my brother and sister-in-law celebrated anniversaries this month. I cancelled my graduation party because of a horrible weather forecast, and then the day ended up being pretty nice. Oh well, I rescheduled it for September and combined it with my and Mr. O’s birthdays… So it will now be Erin and Mr. O’s Birthday and Graduation Extravaganza! September is a fun month for Mr. O and I, because we both have birthdays in September. We’re going to a comedy show at Foxwoods, which will be fun because we both like to eat and gamble. We have our party which I just mentioned. I’m hoping to get a lot of submissions this month for Spry too! August was a nice month. I was busy, which made the month go by quickly, but overall, it was a good time. I felt crappy for about two weeks of the month which is never fun. All in all, I’m kind of glad to start a new month. I’m done with August. The only thing that stinks about being done with August is that the nights are getting darker earlier (which bums me out) and the weather is getting chillier. I love summer. I like fall too, but I hate winter and I can never enjoy fall because I’m always bummed about the upcoming winter. Oh well. Here’s to September! This entry was posted in 365 Photo Challenge, Family, Friends, Graduate School, Mr. O, Reading & Writing, Travel, Wolverine. We put in our air conditioners! That deserves its own bullet point. Tball. I just love it. I was bummed because there were a few rainouts and Wolverine was sick for one of the games, but I have a blast watching all the little kids play. Wolverine is much more into it this year versus last year, and its fun to see him excited and into something. Father’s Day. I’ll celebrate Mr. O for any reason, but I especially like to celebrate him as a father, because he is an incredible dad. and even better than that…. he graduated kindergarten! He is so grown up now! I’m actually keeping up with my 365 photo project. As of today, I am on day 148. The few bad weather days in between the awesome warm and sunny days. Everything happening at once. Every project I am involved in between work, school and my personal stuff is all HAPPENING RIGHT NOW. I have no clue how I am going to accomplish everything. Getting excited about a possibility only to find out it is no longer possible. Sigh. My friends Thien, Amy S, Audrey, Daisy, Chris, Trueblood and Trish all celebrated birthdays. My brother and his wife celebrated a wedding anniversary, and so did my good friend’s E & C.
J and J are getting married tonight! And I am very excited about getting dressed up and spending time with my friends. My friend Linsey and I are working hard on our business venture. It is a LOT of work, but I’m enjoying the process. I’m graduating! This coming residency will be magical, I’m sure. I get to spend ten days on an island with incredible like-minded creatures. I can’t wait to be with my friends again and absorb everything possible from my last residency of graduate school. I am so excited about being a TA, giving a seminar on my third semester project- The Story Behind the Status, doing a public reading, workshopping my newest story and giving a graduation speech. I’m excited to celebrate the birthdays of so many people I love. I can’t wait for Wolverine’s party. I’ll be happy to come home from residency and jump back into my “normal” life with Mr. O and Wolverine. I’m also pretty pumped to make the grand announcement about my new business venture. I liked June a lot. There was a lot of nice weather, a lot of time spent outside. It was a busy month filled with errands and birthday parties and school/work/business/life stuff, but I can’t complain about being busy. It was overwhelming, but filled with mostly good happy things. I consider myself very lucky. This entry was posted in Birthdays, Family, Friends, Graduate School, Mr. O, Reading & Writing, The Story Behind the Status, Wolverine. Well it’s been a while, but I am back with a few links to share with you. One new blog I found (through Pinterest) is Shanty to Chic. I love her tutorials, because everything is so easy and doesn’t seem the least bit overwhelming. Here is a tutorial for easy no-sew window treatments. This is a great read for all writers. Lauren DeStefano urges you to tell your story. Are you a brilliant woman? More than likely that is a yes, because I’ve only got a handful of male blog readers. If you are a brilliant woman, Tara Mohr has ten rules for you. I’ve seen this on Pinterest FOREVER but eventually I’d really like to do something like this for Mr. O. Maybe for our anniversary next year, we can create one of these together. 6-year-old Sam has cancer. Be a superhero and let him know you’re pulling for him. It’s easy. Kate will tell you how to do it, and if you can’t for whatever reason mail something to Sam, Kate will do it for you. Kate, you’re a hero. This week is “officially” Write a Letter to Your Future Spouse Week. Have you done it yet? I did it! Peter came up with the idea (well, he’s been writing to his future wife for a while, and so many awesome other bloggers have joined in. You should too. This entry was posted in Home Improvement, Love Life, Reading & Writing, Weekly Internet Finds. Easter was fun. Wolverine woke up to a note from the Easter Bunny telling him that he hid Marvel eggs all over the apartment. So at 6:30 in the morning, there was an egg hunt! Then we spent the afternoon at my mom’s (and had another egg hunt) and the evening at Mr.O’s parent’s house. It was a nice day. Revising my thesis. I’m telling you, the process of revision is such a wild experience. I’ve learned a lot about the type of grammatical mistakes I continuously make and also about my strengths. I wrote an essay in the second person for the first time this month, and it actually made its way into my thesis with almost no revisions needed. How cool is that? My very good friend T had her baby . He is handsome as can be. There have been so many baby girls born the past few years in my life, so it was nice to cuddle a little boy. I’m actually keeping up with my 365 photo project. As of today, I am on day 88. I started a Project Life Scrapbook! I’m sooooo in love. I need to hustle and start printing the photos I have that I want in there. Yes, I’m a sucker who instead of just starting it when I got it, decided to go back to 1/1/2012 to begin the book! Sigh. There is a good chance that I’m a bit obsessed with this project since I look at the book every single day and make the most minor tweaks here and there. Oh, well… there are worst things I could be obsessed with. Wolverine started Tball again this year. He is so cute in his uniform, and he gets to be on a team with his best friend from school, so he is pretty excited. Well, it wasn’t the healthiest month, but I wasn’t too sick either. I had a few doctor’s appointments to attend, and then I had what seemed to be the stomach bug which never disappeared. I had a belly ache for a few days, it went away, and then it came back! A few headaches here and there… Things like that. But the good news is that I am healthy, and all my appointments have had great results. So many work trainings that last all day. Enough said! This is my thesis semester. Boo. It is a lot of work. (I’m thinking this might be here every month until I graduate). Seriously though…this is my thesis semester. I had to hustle so much this month, I though it necessary to put it in two bullet points. It has been two years since my friend Robert was killed in Afghanistan. This month, our friend John finished police academy and all I could think about was how proud Robert would have been of him. My niece turned NINE years old this month. She came into my life when she was three. Let’s just say, I’m having a hard time with this growing older thing. I want her to stay little forever. My oldest brother had a birthday and so did my friends Elizabeth, Mike and Casey. Cookouts! We went to two cookouts this month and we used our own grill a few times. I love cooking on the grill. Another one of my pregnant friends is due to deliver in May… after her, I will have to wait until July for the next baby.Boo. Finishing my thesis. I have to turn in my completed thesis this coming month. There are no more revisions. No more decisions of what to put in and what to leave out. Seems surreal. I’m waiting to hear back from my mentor of any final revisions and then it will be 100% complete. April was a much better month than March and February. I didn’t feel as down as I did those two months. I’m sure it helped that the weather was nicer, so we went to the park a bunch of times, took a few walks and played in the yard quite a bit. I don’t know how I managed to do as much work as I did for school (and work), but I got a lot done. I don’ t have much to say about April. It went by very fast, and since May is one of my favorite months, I’m just looking forward to it! This entry was posted in 365 Photo Challenge, Birthdays, Family, Graduate School, Reading & Writing.